Edgewood offers tennis programs, private lessons and team competitions for all levels. From our junior programs to adult matches, Edgewood provides a unique tennis experience for the entire family. Mike is one of the most sought after Junior Development Coaches in New England. In the winter he has a player development program at the Middlebury Racquet Club. 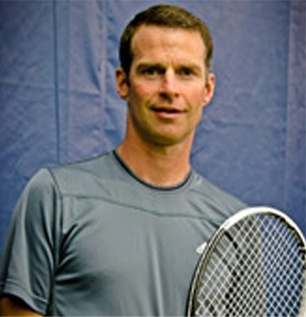 Mike was named both USTA & USPTA Coach of the Year in 2010. He has coached at all levels of tennis, from the University of Georgia to the ATP & WTA Tours. With Mike’s background and his passion for developing Junior tennis players, we are looking forward to building a great tennis program for years to come. Monday-Thursday, 10:30 AM–12:00 PM or 4:00-5:30 PM (23-25inch Rackets). This program takes the fundamentals to the next level of play. According to the USTA Ten & Under Programing, we are using the orange and green tennis balls to develop the junior tennis player into a sound technical and tactical player. This will be the most comprehensive program in the area. All players need to bring the correct size racket. Runs every week. One of the most important components of learning the game of tennis is match play. This is a good opportunity for the junior player to get in a lot of match repetition in a pressure free environment. Runs every Friday for all levels (Red, Orange, Green, Yellow) from 10:30 – 12:00 PM. This program is designed for the most serious junior tennis players. Players with a USTA ranking and the desire to strive to play at a high, USTA NE Sectional level is preferred. Most players who will attend this camp will be ranked in the NE Section. We will cover strokes, tactics, mental toughness and match play. This is the first year of the junior tennis team at Edgewood. This team will be available to members for $15 per session and to non-members for $25 per session. It is open to children of all ages and skill levels, including high school players. There will be practices on Wednesdays and matches on Fridays that will both be supervised by a tennis pro. Junior Sessions – see registration form for complete details. An intense, challenging hour and a half of drills. Focus will be on stroke production, footwork and strategy. Players of all ability levels are welcome. Please sign-up ahead of time; we need 4 players to host the event. Sign-up with a partner or a single for a fun night of tennis under the lights! Advance registration required. Match your game against one of our assistants. Play one set, one tiebreaker and one point. Our professional tennis staff offer a variety of opportunities for players of all ages to improve their skills. Those options are listed below. Please contact the club for information on pricing and sign ups. Please note there is a strict 24-hour cancellation policy for each lesson. Want to enjoy a great summer experience for the whole family? We invite you to join Edgewood!